Due to its experience and constant innovation in the hotel industry, the Asociación de Complejos Vacacionales y Turísticos, A. C. (Association of Vacation and Tourist Complexes) or ACOTUR, will recognize Grupo Sunset World as a founding partner and agent of transformation in tourism in the region and the country. The director of ACOTUR, Felipe Baquedano, recently recognized Grupo Sunset World’s value as a model company in the vacation industry. He stated that its innovative projects in Cancún and the Riviera Maya have contributed to the growth of tourism in the destination, and that the company has also distinguished itself by providing ideas for initiatives for modern times. Baquedano concluded that the presence of companies such as Grupo Sunset World and its director, Orlando Arroyo Marroquín have fueled progress in areas such as sustainable tourism and the use of new technology to make tourist resorts more efficient. 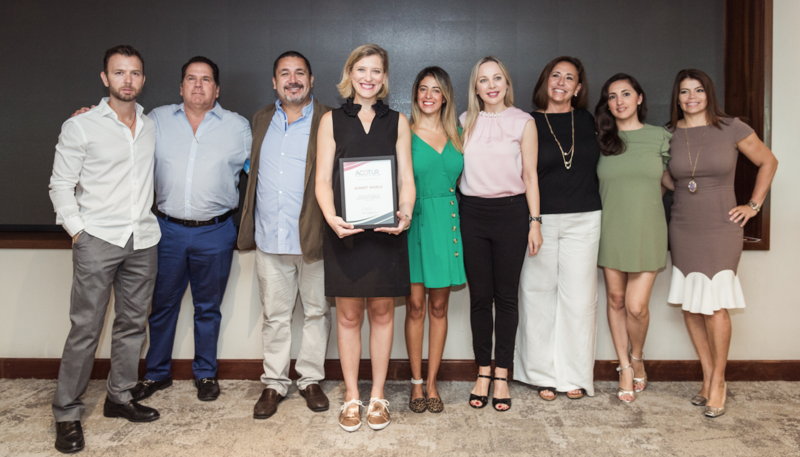 Grupo Sunset World’s award is presented on July 4 at the Sunset Royal Beach Resort in Cancún. Representing ACOTUR, Mauricio Carreón (President), Itzel Voigt (Operations Manager) and Felipe Baquedano (Executive Director) will attend. Annie Arroyo (Brand and Communication Director), Mónica Roberts (Corporate Director of Operations) and Erika García (Executive Director of Marketing 4 Sunset Group) will represent Grupo Sunset World. ACOTUR is the association of owners, operators, intermediaries, builders, developers and / or marketers of vacation clubs in southeast México. Its function is to represent the industry with government agencies and to establish channels of communication and teamwork among affiliates. To date it has more than 20 affiliated companies, which together own some 28,000 hotel rooms in Cancún and the Riviera Maya. Grupo Sunset World is a hotel company with world-class facilities and services designed to ensure an extraordinary experience for each guest. For more than 25 years, the company has been located in the Mexican Caribbean, and today includes the Sunset Royal Beach Resort and Sunset Marina Resort & Yacht Club in Cancún, Sunset Fishermen in Playa del Carmen and Hacienda Tres Ríos, an environmentally responsible luxury resort, in the Riviera Maya. Its mission is to provide exceptional and accessible vacations with high quality accommodations, services and hospitality.